Broadway's biggest stars convened at Radio City Music Hall Sunday night to celebrate the best of the season at the 2018 Tony Awards. 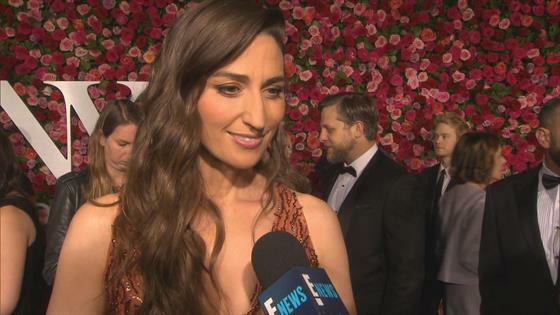 Sara Bareilles and Josh Groban co-hosted the show on CBS, where The Band's Visit received the most wins, losing just one of its 11 nominations. The three-hour telecast featured memorable musical numbers from The Band's Visit, Carousel, Frozen, Mean Girls, My Fair Lady, Once on This Island, SpongeBob SquarePants and Summer: The Donna Summer Musical, as well as a special performance from rock star Bruce Springsteen. John Tiffany won the award for Best Direction of a Play for his work on Harry Potter and the Cursed Child. After thanking the show's choreographer, Steven Hoggett, he asked the audience to join him in a serenade. "One more thing before I leave: It's my boyfriend's birthday today, David Knock," he said. "Would you all join me in singing a little song to him?" The audience obliged, and Tiffany led the theater in singing "Happy Birthday," making Knock blush on camera. Self-proclaimed "beautiful theater actress" Amy Schumer, nominated for her role in Meteor Shower, introduced one of the musical performances. "The first nominee for Best Revival of a Musical is based on George Bernard Shaw's Pygmalion, a comedy about class and sexism. It tells the story of a scruffy flower girl, Eliza Doolittle, who is transformed by Henry Higgins, a mansplaining expert on dialects." Schumer said the revival celebrates Eliza's "growing self-confidence" and champions "equal rights for women," quipping, "We actually don't have that!" To celebrate the magnificence of Harry Potter and the Cursed Child, which won six awards, Bareilles mentioned Groban was an amateur magician as a child. "It's true. I was that kid. I thought that taking the magic route would open up a big new world of friends and admirers. I was incorrect," he joked. Bareilles picked up "a few things" after seeing the two-part play, so she challenged her co-host to performer some tricks and try to one-up her—and boy, did he, transforming into the world's most famous wizard himself. "Harry Potter? I mean, Jamie Parker?" Bareilles asked. With a smile, he replied, "Josh. And you thought I couldn't do magic." After 30 years away from the Broadway stage, Glenda Jackson returned to star in Three Tall Women. She won the award for Best Performance by a Leading Actress in a Play, earning the Triple Crown of Acting in the process. It took Jackson 47 years to do so, becoming the 24th person to do so since 1953. The actress earned an Oscar in 1971 for Women in Love, and the following year, she won two Primetime Emmys for her role in the BBC drama serial Elizabeth R.
Bareilles and Groban paid tribute to all the hardworking performers through the musical number "8 Times a Week," set to Sia's "Chandelier." The lyrics poked fun at the brutal schedule, with the co-hosts singing, "I've gotta sing this thing eight times a week / Sing it eight times a week / I want to scream / But I really can't speak / I'm on vocal rest all week / Who in their right mind would schedule the plays to be twice in a day / I've got to sing this thing eight times a week / Sing it eight times a week / I'm holding on for dear life / Someone check on my kids and my wife / Dear Broadway, you're out of my league / Why the hell is this eight times a week?" Two of the season's biggest musicals—Mean Girls and SpongeBob SquarePants—led the nominees with 12 apiece. Mean Girls lost in every category, while SpongeBob SquarePants fared slightly better, as David Zinn was honored in the Best Scenic Design in a Musical category. The Band's Visit, based on the 2007 film of the same name, premiered Off-Broadway in December 2016. It debuted on the Great White Way 11 months later. It received Tony Awards in 10 categories, including Best Musical, Best Actor in a Musical (Tony Shalhoub), Best Actress in a Musical (Katrina Lenk), Best Featured Actor in a Musical (Ari'el Stachel), Best Direction of a Musical (David Cromer), Best Book of a Musical (Itamar Moses), Best Original Score (David Yazbek) and Best Orchestrations (Jamshied Sharifi), among others. Scott Pask, who was nominated for Best Scenic Design of a Musical, lost out to SpongeBob Squarepants' David Zinn. Heartfelt speeches are common at the Tonys, and Sunday's ceremony was no exception. It began with Angels in America's Andrew Garfield, who dedicated his award to the "countless" members of the LGBTQ community who have "fought and died" to protect the spirit of his character, Prior Walter. Carousel's Lindsay Mendez shared a story about maintaining her integrity early in her career, saying, "I was told to change my name from Mendez to Matthews or I wouldn't work. But I want to say how proud I am to be a part of a community that celebrates diversity." Finally, The Band's Visit star Ari'el Stachel got choked when he collected his award. "For so many years of my life, I pretended I wasn't a Middle Eastern person. I am part of a cast of actors who never believed they would portray their own races," Stachel said. "I want any kid who's watching to know that your biggest obstacle may turn into your purpose." Robert De Niro was set to introduce Bruce Springsteen's performance. Before doing so, he took aim at President Donald Trump, throwing his fists in the air and saying, "I'm going to say this: f--k Trump. It's no longer just 'Down With Trump; it's, 'F--k Trump." While the audience gave De Niro a standing ovation, CBS censored his expletive laden rant from the live broadcast. Melody Herzfeld, a drama teacher who protected her students at Marjory Stoneman Douglas High School when a gunman massacred 17 people in its hallways earlier this year, was given the excellence in theater education prize. One of her students, Tanzil Philip, had previously reached out to producers and asked if she could thank the Broadway community, during the ceremony, for its ongoing support. But Matthew Morrison, who introduced the performance, said they could do her one better. "Tan, rather than inviting you on to this stage to say thanks to us, our Broadway family wants to give and say thanks to you by sharing the stage with you and your classmates," he said. The students sang an emotional rendition of "Seasons of Love" from the musical Rent. Many audience members were in tears and gave the students a standing ovation.